Description: Probably one of the coolest KCS units I have ever caught. For some reason I thought they were all retired. Title: KCS 2917 Sits silent on the fuel rack. Description: KCS Carla Dodger switching at Mallin, La. Description: I was coming across the KCS on the US 412 overpass as the dodger was working Pipelife, its lead unit just poking out of the late day shadows into the sun. Description: The southbound H train was held at Gentry for the dodger to get into the siding. He held to the north of town so as not to block road crossings, allowing me a shot of the local. 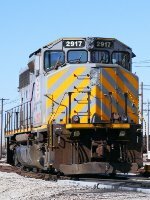 Description: KCS 2917 at the servicing facility in Monroe, La. Description: When the northbound empty TXUX train didnt start once the H train cleared the north switch at Stilwell, it caused me to miss the shot of the Belle leader at the station. Heres why the northbound didnt get the signal: this light power move south, coming into town about 15 minutes behind the H train. Description: I had gone up to Gentry to drop off some food at my sons house, and saw a headlight as I crossed the tracks in town. I ran up toward the McKee plant, to find the dodger was just getting his train back together to head south. Ive wanted to catch him working here, with the company sign and the train together. It will have to be another day. Description: The dodger is rolling a dozen cars past the Davidson Rd crossing, making a quick run to a quit at Watts. Description: I took off from McKee Foods before the train started, and set up so I could get this shot of him rolling his dozen cars past the Curran Feed Store downtown. Across the tracks is another Gentry fixture, The Chicken Coop, a long time flea market. Description: Sounds rather Mosaic, doesnt it?? The L 102 dodger is working Pipelife in Siloam Springs as I approach on Kenwood St. Its a grab shot from the car, but I like it. Description: The dodger spends a lot of time pulling up and shoving back at Pipelife, and an awful lot of time standing still. I caught one of those moments from the US 412 overpass, looking down on a former CN widecab, now repainted into the Belle scheme. Looks good on that nose. Description: The dodger rolls past the Cobb feed mill at speed, no work here today. Description: The dodger has completed its work at Peterson Farms, now a Simmons plant, and rolls toward downtown Decatur. Description: The dodger rolls past the cemetery at CP Flint Creek with 13 cars. Description: The lead unit of the dodger sits next to the rest of his train, left on the main track while they switch Little Debbie. Description: The car back on the house track had been set off for some reason, probably a defect that needed repair. The dodger was to pick it up, but whatever reason it was there apparently kept it there, as they didnt take it in the end. View is from the Ark 12 overpass. Description: Youve probably heard of them, except not likely by this name. They make those Little Debbie cakes and cookies that you find just about everywhere. One of their plants is here in Gentry, and a KCS customer for inbound freight, which consists of vegetable oil and flour. The dodger switches the plant, a full set of Belles doing the honors. Description: The lead unit of the dodger peeks out from behind the sign.